I have always been a big wearer of jeans. I love jeans and had just gotten two new pairs when the baby arrived. The other pairs, that I had, either had holes in the knees, stains from yard work or painting, or were getting to the point of wearing out. 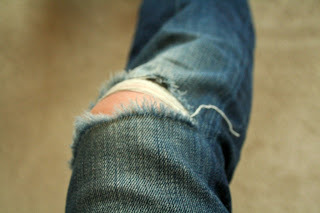 Within a week of wearing my new pair of jeans I noticed the knee areas were looking not as new as the rest of the jeans. As a result, I have gone back to wearing my jeans that were on the verge of holes. It has only been a week and already I have ripped through the fabric! I don't know how you can get away with having a toddler and not crawling around on the floor all of the time to play, clean, and chase! My shirts have stayed the same, but they are spotted with food and who knows what else if I haven't needed to leave the house. If I do need to go out, you can bet I have changed my shirt just before walking out of the door! I think I also smell differently. Besides wearing the baby's food, I am constantly using baby shampoo, baby lotion, and diaper cream. I'm sure that people can smell that on me. I know I can smell it on myself!